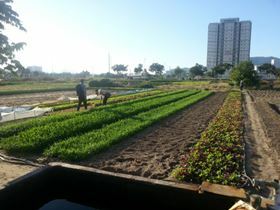 Agriculture in the Vietnamese city of Da Nang. In the future, residents can use purified wastewater to water their crops. The wastewater is purified biologically. Anaerobic bioreactors ferment the organic component of the wastewater into biogas. They can be combined with membrane filtration so that all larger particles, including bacteria, remain inside the bioreactor. Although currently, for cost reasons, this is not part of the initial plan for Da Nang. Fraunhofer says that the DEUS 21 concept was developed to maximize the recycling of wastewater and the resources it contains. Biogas from the anaerobic bioreactor can be used for cooking, as well as used to generate electricity and heat or power vehicles. It is also possible to draw additional thermal energy from the wastewater because it remains relatively warm after processing. A further by-product of the wastewater treatment process is nitrogen-phosphorus fertilizer, which is secured through a process of precipitation and ion exchange. Fraunhofer adds that the system could be implemented in areas where there is currently no sewage treatment. It can also be adapted to meet the needs of arid or semi-arid regions.